Let’s explore some of the chemicals commonly found around the home in some of the most popular cleaning products. Prepare to be a little shocked, and hopefully motivated to make a few changes the next time you’re buying cleaning products! 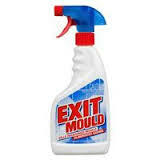 Did you know that Exit Mould only bleaches the mould and doesn’t kill it? It certainly makes your bathroom sparkle however when you look into it’s performance you may be surprised to know that it does not do what it claims. Don’t believe me? Water – Drinkable and wonderful. Deemed to be extremely safe! Sodium Hypochlorite – Commonly known as bleach. It is a strong oxidizer and corrosive. Can burn skin and cause eye damage. Sodium Hydroxide – Caustic soda, suspected skin and eye irritation, respiratory toxicity (when I last used Exit Mould I remember breathing plenty of the stuff in). Can cause ecsema, dermatitis, itching, hives and rash. Lauramine Oxide – May be synthetic or palm oil derived. Used as a surfactant, viscosity controlling. May cause skin irritation. Sodium Silicate – Used as an anti-corrosive. Can cause skin irritation. Fragrance – Synthetic derived. Actual ‘fragrance’ ingredients are not identified. Potential effects are allergic reactions, asthma. Can effect the immune system and nervous system. Used as a masking agent. Fragrance often contains pthalates, which effect our endocrine systems. Synthetic fragrances are also known be neurotoxins. So what is a safe alternative for killing mould? The answer is vinegar or clove oil. Simple (and pure) as that! Not to mention cheap! Clove oil kills mould at the spores. In a spray bottle combine 1/2tsp Clove Oil and 500mls water. Spray onto mould, leave for a few hours, then wipe off or rinse. In a spray bottle put 10 drops of the thieves blend per 300mls of water. Use as a surface spray for general cleaning and combatting mould. In a spray bottle put vinegar. Simply spray (or scrub) with vinegar and wipe. Then rinse. The vinegar smell will pass within a few minutes. Use fans to keep air flowing. Mould loves a humidity and still air. If you can get some sun on the area.